I find myself exhausted by the political swirl and the constant need to do everything faster. I find respite in meditation, in nature and in art. On Friday evening I found respite when I went to the Monmouth Museum for the opening of Lorraine DeProspo's exhibit The Rhythms of the Sea. This is an exquisite show and I encourage everyone who can go there, before the show comes down on July 3, to do your self a favor and go experience these beautiful paintings. Walking into the gallery you are enveloped by the environment. You stand in contemplation as if you were on the shore looking out to sea. We, like the artist, are drawn to the sea, to quiet ourselves and to witness the nature of the ocean; immensity and accessibility. Standing in front of the ocean we are reminded that the past and the future are contained in the present moment. In front of these paintings one senses the same momentariness and fluidity as when standing with your feet in the damp sand. As an artist, I am all too familiar with the insecurities faced in the studio while engaged in a dialogue with painting after painting, you begin to wonder will anyone else join in the conversation? Lorraine's work is an object lesson in what can be achieved when you learn to ignore such questions and do the work to which you are called. Lorraine has been called to study the ocean and fog. And she has responded. One result of this ongoing in-depth study is her ability to distill the experience of fog and ocean with deft and minimal gestures. We see this in Winter Scape 1, where using a sliver of reflected light she defines not just the horizon, but by contrast, the fog above and the water below. 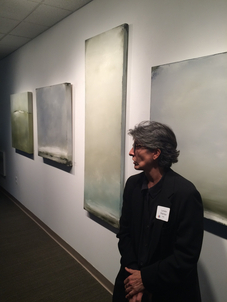 Lorraine describes these paintings as an "ongoing diary of the seascape". I find this an apt description. Study begins with observation and continues as one ponders and analyzes, looking for the key to understanding. Diaries are a tool used to capture reflections on observations and enable deeper exploration. Lorraine's paintings breathe the atmosphere she has come to own through her ongoing exploration. My definition of an artist, (I am not speaking of visual artists only here) is a person who internalizes, synthesizes and transforms their experience into a vivid visual image (or poem or dance or song...) and communicates the derived essence to the viewer. 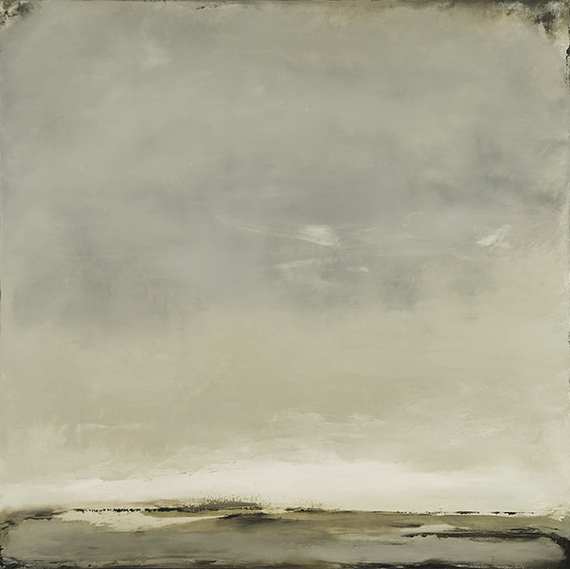 And so, in the presence of Lorraine's paintings we do not hear the waters movement nor feel the cool damp on our cheeks but we see what the artist has depicted and we remember both the physical sensations and the tranquility we have experienced. Once again we paradoxically have the sense of being apart from and a part of the world in which we live. I need to be clear on one point. These are beautiful paintings which impart their own truth to the viewer. I like the darkened corners of some of the paintings, they serve as a frame, reminding us of the "objectness" of the painting. These dark corners remind me of pictures from the infancy of photography, (I always think those corners are burned). Here they remind you of the physicality, the surface of the painting. For a visual artist, the idea, the experience or whatever it is that initiates the art making process, must be translated into a physical object. This translation of inner experience to outer communication, necessarily includes tools and methods of working. Lorraine has devised her own method for creating these paintings. She never uses brushes, she uses palette knives only. Lorraine works in a restricted and subdued palette to evoke not only mood but a sense of space using the bare minimum of color, line and edge. 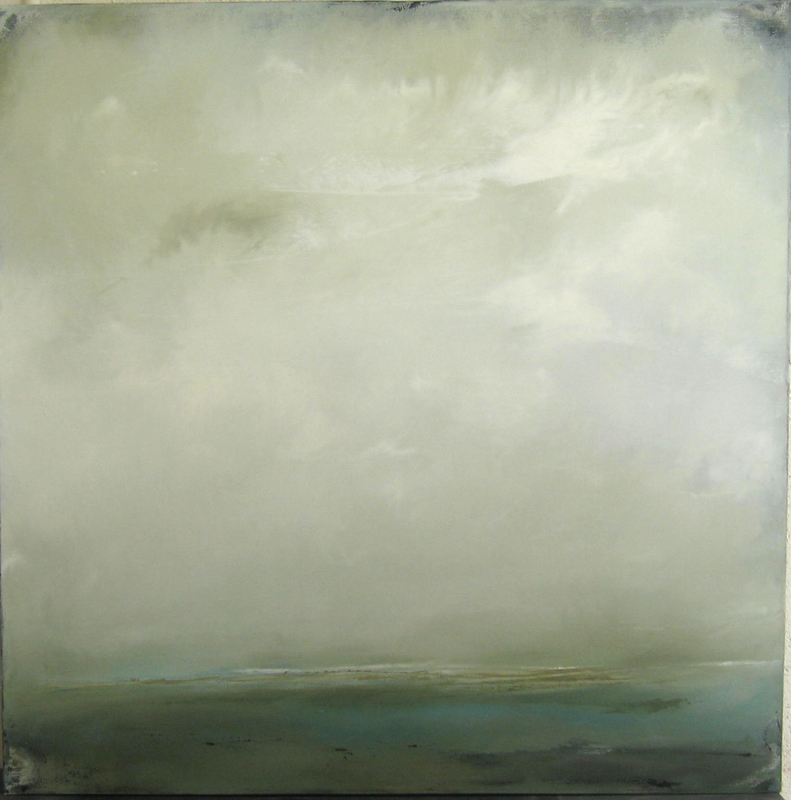 She paints in oil with cold wax medium which gives a soft depth to the surface, appropriate for these atmospheric paintings. All of these choices contribute to the success of this work.